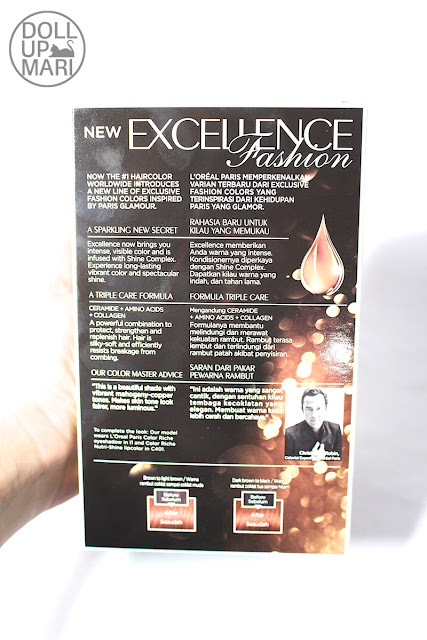 Weeee, this is my first ever non Japanese boxed dye review! 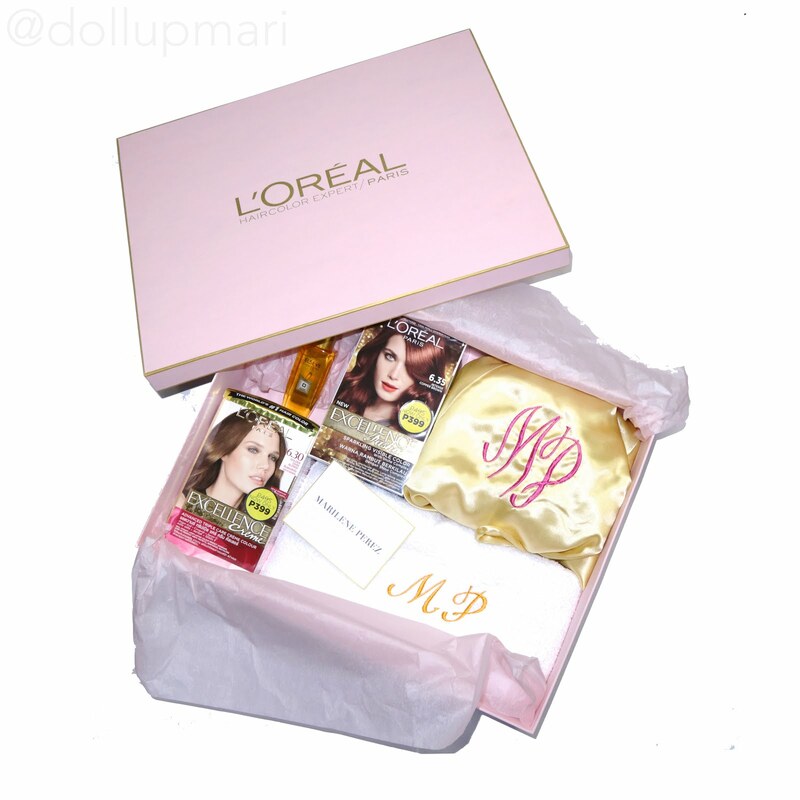 L'Oréal graciously sent over this suuuper pretty box with a towel, bath robe, L'Oréal hair oil and two boxes of hair color inside. It was sooo thoughtful of them to have sent over the robe and towel with my initials embroidered on them! I actually didn't use these in my actual dye job as they were too pretty to get soiled. So this is how it looks like. This is L'Oréal Excellence Fashion. This is actually their hair color line more targeted for people with grey hair issues. That is such because the formula is not like the foam type ones and you need not use up all the color in one sitting. The manual also discusses regrowth coverage very extensively. And the color itself is one that will show up better when put over grey hair rather than black/dark brown hair. As for why I say that this will appear better on grey or white hair, I got here a swatch list of L'Oréal's professional hair color to give a general idea. In general, in the hair color world, level 1 is assigned to black, and the higher the number, the lighter the shade. Depending on the brand, platinum blonde can be assigned a nomenclature of level 9 upwards. Level 7 to 8 is the lightest an Asian brunette can go without needing bleach, and that normally will count as the "medium brown" shades we know of. Level 6 and level 7 may be just one number apart in nomenclature but in reality the difference in brightness and lightness between the two can be immense at times. My hair has been maintained at level 7 to 8 thanks to having access to hair experts who know what I exactly want to achieve. So for this look, I was realistic that my hair would be much darker as level 6 is much darker than my usual level 7/8 color. If you want to get the brilliance of the model's hair in the box, you either have to use it over hair that has already been bleached or hair that is white/grey (which in itself is void of color). It is not the company's fault whatsoever as the box color is really what will occur in greyer hairs and in markets where women's hair strands are lighter. There really are just real limitations for Asians when it comes to hair color without bleaching. So this is how it looks like. The kit comes with a protective pre-color serum that you apply right before coloring and do not wash off even into the dye job. The worst enemy of any dye job is wet hair, which is why the best scenario is to color your hair in the morning after you've washed your hair. So yes, the serum stays. There is also a colorant tube, a developer (aka the peroxide), and they added in a small bottle of their protective post coloring conditioner. So this is how everything looks like out of the box. 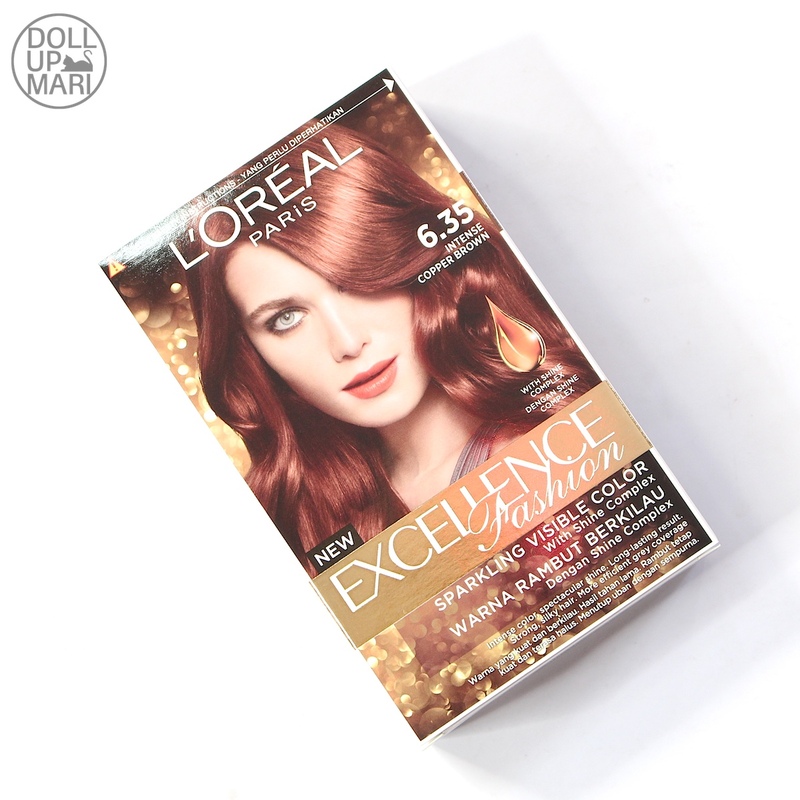 For the hair color itself as an experience, I liked that it was not very pungent, was very gentle on the hair, and didn't leave much of a trail of damage. My hair felt normal after the dye job. Wash off was not so hard, although I have to be careful to apply wax on the areas of my hairline as the dye did leave a stain for a few days or so. I felt that the conditioner offered good value for money as the conditioner was obviously good for more than one use. In fact, it's been two weeks and I haven't had the need to use it again yet. Soooo I am so sorry I don't have good before and after photos!!! I used this in a rush as I was going on a trip, and given my camera issues at the time, I wasn't really able to properly plan for this and stuff. These are photos before. So my hair is lighter and more golden toned. As you can see, after the dye job, my hair became darker and a bit reddish toned. But from afar and when people saw me in real life, it felt like dark chocolate to them. Color wise, I was sad that all of the colors in this collection are at levels 5-6. I was hoping for something in level 7-9 which would be more apt for my needs and preferences. 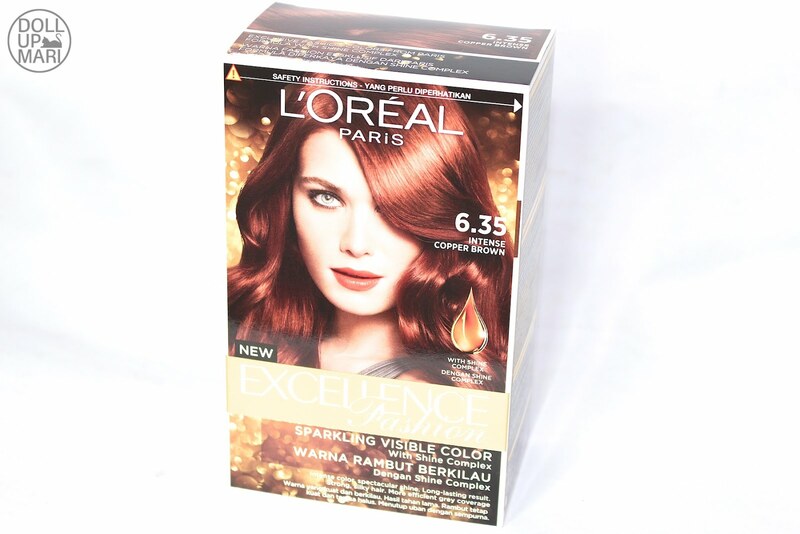 I am still trying to get access to L'Oréal professionnel hair color as they have colors up to level 12 because to be fair, you can't beat the original brand that made hair color possible. But for those who are looking for practical colors, or those who have white hair, this will surely work well for you. This retails for Php495 when not on sale, and Php399 when on sale. Please ask your nearest L'Oréal counter for more details. 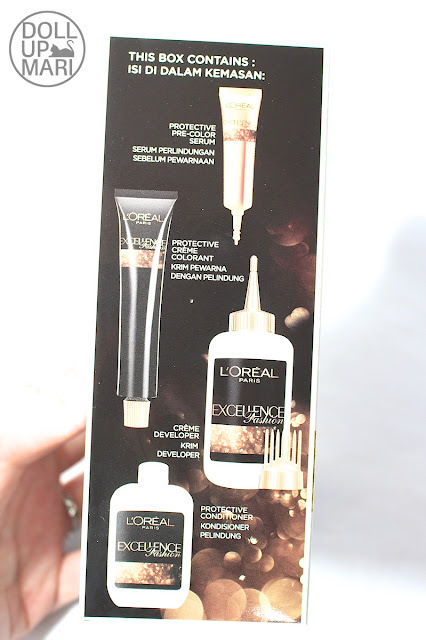 I have been wanting for so long to try to color my hair on my own using the Loreal color products but hesitant because I don't know if i will be able to do it by myself or if my desired color will really show up. You know i don not want to waste my money buying things that at the end i do not know how to use or even not been able to use at all. I enjoyed reading your article, it helped me to have the courage to color my hair next next weekend since it seems like an easy task and the outcome of the color is really nice. I don't know why if its only me that is afraid to try new things without seeing anyone trying it at first. Also, I realized that its only ignorance or zero knowledge/training that lets people be afraid to do/try things. When people have ample information about a product that is the time that they get decided to try it on theirselves. As the saying goes, to see is to believe. Overall the experience shown seems to be enjoying so I wanted to have a try on myself also. Plus seeing Loreal protective serum, protective creme colorant, protective conditioner is a lot of protection. I feel that my hair is safe and in good handes using these colorants makes me more excited.